Find a vacation home to rent in Kvam Municipality from our list of vacation rental properties. Campaya has over 28 vacation homes available in Kvam Municipality, which give you the possibility to locate a unique accommodation in Kvam Municipality which completes your check-list in search for the perfect self catering vacation apartments in Kvam Municipality or vacation villas in Kvam Municipality. Welcome to this unique holiday home, located directly by the Hardangerfjord. There is a terrace facing the fjord where you can enjoy the view while preparing the supper on the grill. Welcome to a light and modern garden apartment with direct location to the Hardangerfjord. The apartment has a beautiful, outdoor place facing the fjord. Welcome to this beautiful cabin situated in quiet surroundings. From the cabin you have a spectacular view over the Hardangerfjord and towards Folgefonna. This cosy holiday home is surrounded by picturesque nature and enjoys wonderful views of the Hardangerfjord. Cabin with great view over Hardangerfjorden and Folgefonna. The cabin has a beatiful garden in a quiet environment. From here you can enjoy the sun from early morning till late evening. Welcome to a cozy holiday home in nice surroundings with lovely view over Hardangerfjorden. Here you can enjoy long and lazy summerdays on the terrace. This gorgeous little holiday home provides a cosy, homely base for your Norwegian adventures. Spend your next self-catering trip in this very high quality and well-maintained holiday home. This property is a comprehensive house with all necessities and attractive appearance. Only one hour from Bergen you`ll find this amazing holiday home. The house has spectacular view over the surroundings. The view can be enjoyed from the nice terrace. 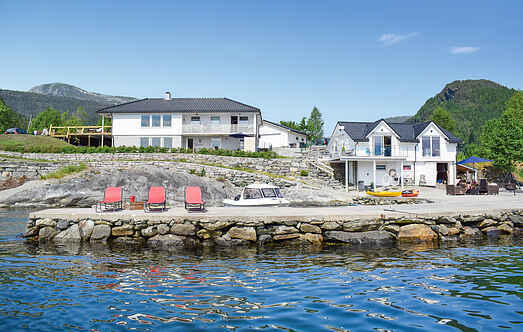 Holiday home in the seaside at Hardangerfjorden, with wonderful views over the bay towards Folgefonna. The apartment is of high standard with fine details and a Jacuzzi. This large vacation house is located on a sunny and - in the winter - snowful spot, surrounded by wonderful nature with hiking paths & nice lakes for angling. A great cabin of a good standard close to the Hardangerfjord. The cabin has several terraces which can offer a nice view towards Ljonesvågen. You find this holiday house located in fantastic surroundings in Kvamskogen. Welcome to this lovely holiday home in beautiful and natural surroundings. Small cottage with a large garden and fantastic views. Fishing in the fjord. Walking and motoring tours. Shower/WC/washing machine in the owner's house 20m away.